A winter chill has set in here at ModCloth and cast an icy frost on our creativity. We know we want to wear this beautiful blue and cream floral, but we can’t think of what to call it. Once again, we need your help! Along with the happiness that accompanies naming your very own ModCloth item, the winner will also receive the coat in their size (sorry, this one is only available in S, M, and L) and a $50 ModCloth gift certificate. The runner-up will receive a $25 gift certificate. Post your submissions to this blog post before Monday, November 17th at midnight. Please include a valid email address with your submission, so we can contact you if you win! The winner will be announced this Wednesday the 19th. We think winning a winter coat is just the thing to get you in the mood for Christmas shopping! I think it should be called ‘the icy spring coat’. It seems fitting since it is obviously a more wintery coat and it has a floral print. I think it should be called ‘The Good China’ coat…it’s like a design you’d find on your good china. It reminds me of something Jackie O would wear in the springtime if it were windy. It looks very Asian-inspired to me. I think you should name it Flora & Fauna! stella! i think that coat looks like it can be called the stella. super cute! It’s the perfect coat to wear to an art gallery- just make sure it doesn’t end up on the wall itself! Don’t be caught in the cold at this winter’s concerts. The “Papier Peint Trench”… it reminds me of vintage french wallpaper. In a really, really good way. Miss Indigo Primrose Coat~ My personal #1 pick!! Blue Condition Coat (because the song “Blue Condition” is by Cream, and the coat is blue and cream . . .). Lucy in the Sky with Diamonds Coat – it reminds me of those cellophane flowers, just not ‘yellow and green’. Thankfully I suppose. I REALLY love this coat! Really neat! It looks like the flowers have been frost bitten. I have a few Ideas. My Favorite is Starred. – reminds me of classic black & white films, stunning with red lipstick. Flower in a winter’s tale coat. or Winter Floral Coat (kinda like winter formal) har har. I don’t know, those look like pine cones to me! Five minutes before the big explosion. Trench coats always make me think of spies and this one covered in Chrysanthemums is just double oh heaven. The Flora Tristan, after one of the founders of the modernist feminist movement. She advocated for workers’ unions and women’s equality, and was stylin while she did it. I would definitely call that the Mrs. Dalloway coat. It looks as though it were ripped straight from a Virginia Woolf novel. Macintosh rose coat. Makes me think of macintosh rose wallpaper.
. . . because this very victorian print makes me think of the old, lacy, moonlit gardens in all of the above. Would You Care For Some Mum? 1. Floral Noir Trench – I could see Lauren Bacall wearing this in a jazzed-up film noir. 5. Skadi’s Walking Coat – Skadi is a Scandinavian winter goddess – one would certainly feel like a winter goddess in this! painting the roses blue coat. Waltz of the Flowers Trench – reminds me of the movement from Tchaikovsky’s nutcracker! The Ice Queen’ s Garden coat. you know, named for the wacky character, Hyacinth Bucket (although she swears her last name is pronounced “Bouquet”) from the brittish television comedy “Keeping Up Appearances”… she’s ALWAYS wearing floral patterns! Because that’s the sound it makes when my mind sees it. 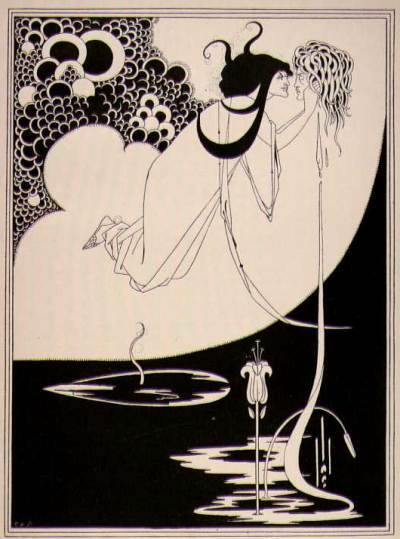 after Aubrey Beardsley, the illustrator…check it! -for all the rosey details. (1) Cosmos which is a flower but it also means a harmonious system which can refer to the pattern of the coat. (2) Sampaguita. It’s the national flower of my country and although it’s not actually the flower o nthe coat, it just stuck with me and it’ll probably be eye catching since it’s not an English word (but pronounced as spelled so easy enough). “Dainty as a Duchess” because who doesn’t want to look like royalty? In this stylish coat you’re not too far from living like the royals. Posy Poesy…. continuing the emerging french theme! Frigid as in cold and icy because the temperature is dropping outside. Blossom/Bloom because of the floral pattern. (Sacred Blue) The coat colors seem very French and Sacre Bleu is a GREAT album.